Gore shows a series of four images of Lake Chad on page 116 of his book. The pictures show the lake shrinking from about 25,000 square kilometers in 1963 to about 1,500 square kilometers in 2001. Very dramatic indeed, this drought was abrupt and catastrophic for the people in this region south of the Sahara desert. Gore implies the following sequence of events: Anthropogenic CO2 causes Lake Chad to dry up, then the stresses caused by this depleted resource cause, or exacerbate, regional violence, famine and genocide. 1. Lake Chad was shrinking long before anthropogenic increases of CO2. It is known that Lake Chad was vastly bigger several thousand years ago than it was in 1963, when Al Gore starts his tale about the lake’s demise. Paleological evidence makes it clear that abrupt changes have been common and the lake has shrunk to its current size or smaller multiple times in the last thousand years. 2. The current low level of Lake Chad is due, at least in part, to greater demands on the water of the in-flowing rivers. The population of the region has more than doubled since the most recent drought began and a large fraction of the water that would normally flow into the lake is being dammed and diverted for irrigation long before it reaches the lake. While he is almost certainly right about water shortages aggravating social problems, he is certainly wrong about anthropogenic CO2 being the cause. His aim goes wildly off the mark when he makes an important, but wrong, point on the page 117 where he says “When it was full, Lake Chad was the sixth largest lake in the world…” This gives the impression that prior to 1963, “when it was full,” the Eden that was Lake Chad had existed in a 25,000 square kilometer steady state perpetually from the deep past. 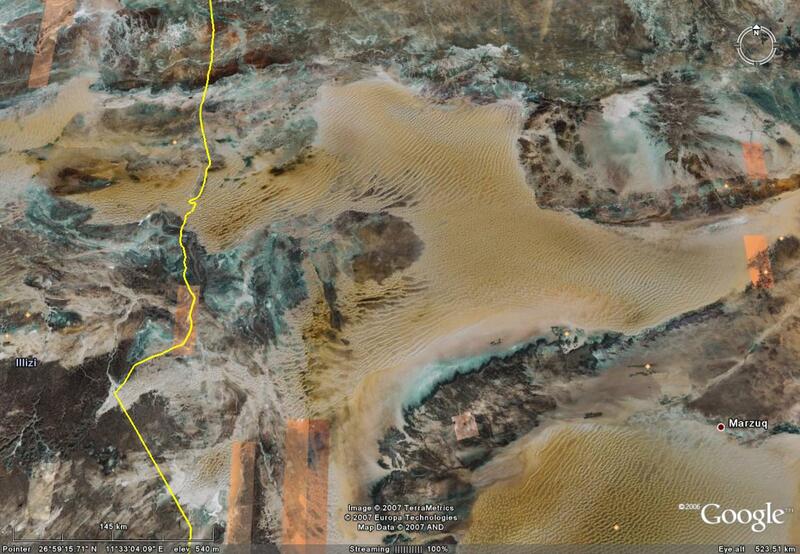 The truth is that Lake Chad has undergone extraordinary changes in the relatively recent past. The Lake Chad of 1963 was just a tiny remnant of what is known to paleontologists as “Lake Megachad.” Just a relatively short six to seven thousand years ago, when Badarian culture was populating upper Egypt and the Yangshao and Longshan cultures of prehistoric China were cultivating grains, domesticating animals and making villages, Lake Megachad was the biggest lake in the world! It was 400,000 square kilometers – five times bigger than Lake Superior is today! 7000 years ago its surface area was 16 times bigger than it was in 1963, and its volume was dozens of times greater. In the Journal The Holocene, Drake and Bristow (2006) point out that Lake Megachad may have been as large as 800,000 square kilometers further back in time. According to Section 3.1 of the United Nations Environmental Programme (UNEP) report, Africa’s Lakes – Atlas of Our Changing Environment, Lake Chad “levels regressed until, between 5,000 and 2,500 years ago, the lake assumed its current level with periodic oscillations. By 1908 the lake levels were so low that the lake resembled a vast swamp with small northern and southern pools. During the 1950s, levels again increased, joining the southern and northern pools, so by 1963 the lake covered 22,902 km2 (8,842 square miles).” Note that 1963 is the year the Gore conveniently starts his tale about Lake Chad. Somehow he forgets to tell his readers and viewers that 1963 Lake Chad was at its highest level for the entire 20th century. (See figure 1.) In fact, the lake size increased dramatically during the 50 years previous to 1963. Gore’s narrative would not be quite so compelling if he had started it in 1908, because by 2001 the lake level was almost the same as it was back in 1908. Figure 1. 130 year history of Lake Chad elevation. 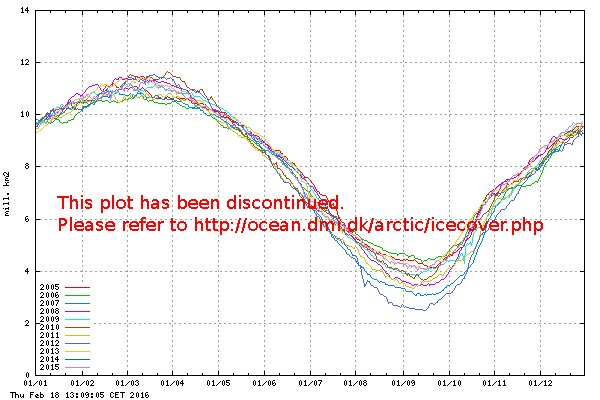 Note that the 20th century maximum occurred in 1963. The rapid elevation drop at the end of the 19th century occur ed before significant increased in anthropogenic CO2. The most recent elevation data has the lake level almost as high as it was 100 years previous. Double click the image to see a larger version. And there’s more. There were other megalakes that existed in the Sahara. 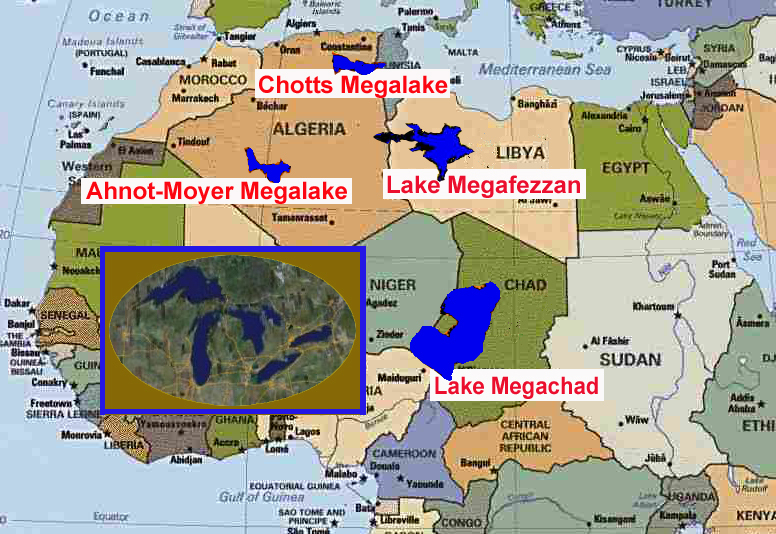 Lake Megafezzan was north of Lake Megachad in present day Libya, the Chotts Megalake was in present day northern Algeria and the Ahnot-Moyer Megalake in central Algeria. Figure 2 shows a map of North Africa with the now missing megalakes. The inset of the North American Great Lakes (from Google Earth) is at the same scale and is included for comparison purposes. These lakes did not dry up millions of years ago. Chotts Megalake still existed as a of fresh water body during in the holocene just thousands of years ago, when human beings had already spread over the entire globe. It clearly was not anthropogenic CO2 that caused the mega-lakes to dry up or Lake Chad to shrink and oscillate so widely in the previous several millenia. How can “An Inconvenient Truth” make the claim that anthropogenic CO2 is responsible for Lake Chad’s recent shrinking and oscillations when this is a continuation of a long existing pattern. Figure 2. The Megalakes of the Sahara region. These gigantic lakes have disappeared in recent millenia. Lake Chad is the only remaining trace of water from these giants. The inset shows the North American Great Lakes at the same scale (from Google Earth) for comparison purposes. The megalake size and shape data is from the Megalakes Project. 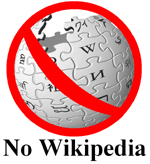 Double click on the image to see a larger version. Larger and larger fractions of the in-flowing water is being diverted before it reaches the lake. A profound example of the impact of human diversion of water from Lake Chad is illustrated in the (UNEP) report mentioned above, where it is pointed out that “Since the 1960’s human demands for water near Lake Chad have grown rapidly. Between 1960 and 1990, the number of people living in the lake’s catchment area has doubled from 13 million to 26 million.” This growing need for water has resulted in huge irrigation projects and dams along the rivers that feed Lake Chad. Of the Komadougou-Yube river system the report states “The upper basin used to contribute approximately 7 km3/yr to Lake Chad. Today, the bulk of this water is impounded in reservoirs within Kano province in northern Nigeria, and the system provides just 0.45 km3/yr.” By my calculations that is enough impounded water each year to double the current volume of the Lake. But you’re just supposed to curl up in the fetal position and be alarmed that its happening now. If we see it happening, its bad. Gore will continue to abuse Lake Chad and Kilimanjero like this because people don’t have the sense to ask questions. the ones who do have the sense can’t because he won’t allow any questions to be asked. I first observed the size of the prehistoric lakes and rivers while taking courses on Africa in the 1960’s. Mr. Gore does not care for the truth. He loves money and power. I would love to have a world atlas showing the planet in 500 year periods from 4 million years ago to the present. It will be gone before it is ever created. Brilliant insight from the Chula Vist, California area. Get a spell checker.